The Golden Monkey (Cercopithecus Mitis Kandti) is a local subspecies of the widespread Sykes Monkey, also known as the “Blue Monkey” and is endemic to the high-altitude forests of the Virunga massif. Golden monkeys are a beautiful sub species of monkeys from their golden coat, long tail to the playful and intrusive character. 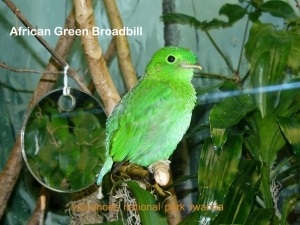 They spend most of their time leaping from bamboo branches or skipping on the forest floor in a manner that offers lasting memories to those who come to trek them. 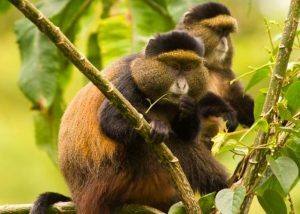 Their amazing and impressive character has made golden monkey trekking one of the popular Rwanda safari activities done at the foot of Mt Sabyinyo. Golden Monkeys are found in Volcanoes National Park where Mountain Gorillas are also found; Mountain Gorillas and Golden Monkeys therefore co-exist here. 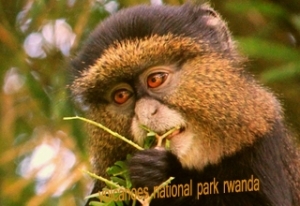 There are two habituated (made used to the presence of people) groups of Golden Monkeys in Volcanoes National Park of which tourists trek on their safaris. 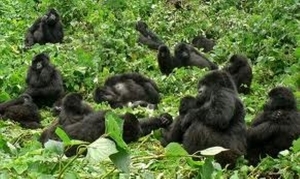 Each of the group comprises around 80 – 100 members which is a great sight to witness when you get close to the monkeys. 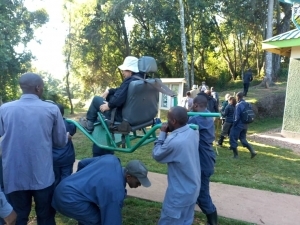 Just like Rwanda gorilla trekking safaris, Golden Monkey trekking starts in the morning from the park headquarters of Kinigi at 7:00am (only once a day). Golden Monkey trekking lasts about 4 hours with no limited number of tourists allowed to trek a golden monkey group. A golden Monkey permit is currently USD100 per person per trek and tourists are permitted to stay for 1 hour with the monkeys. Permit booking can either be arranged in advance or booked at the park headquarters on the morning of the trek. It is easy to find the golden monkeys since they mostly live at the bottom of the Volcano Mountains with in the bamboo forest, and by just following the traces of fresh leftovers from the bamboo shoots eaten, the trackers are then able to locate them with in less than an hour. In case you need porters to help with luggage, they can be hired at the entry point of the park. Since the forest is covered with bamboo, it is not difficult to get good photos. However, a longer lens is recommended as they can be more active and playful so could easily move away from you as you get close. Just like any safari, you need to wear appropriately for your golden monkey trekking experience. It is best to wear long trousers, long-sleeved shirt, a hat, light-rain-jacket, waterproof hiking boots. Other things to carry include a waterproof daypack, enough bottled water with some snacks and of course your camera and all the necessary equipment. 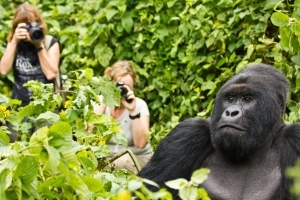 On a gorilla safari to Volcanoes many tourists also opt for Golden Monkey Trekking especially on the popular 13 Days Uganda-Rwanda Safari which is tailored with wildlife safaris in Uganda’s national parks. In Uganda, golden monkeys are also found in Mgahinga Gorilla National Park which is the only habitat to the species in the country giving the park a slogan “where gold meets silver” since it has mountain gorillas too. Whether a safari in Rwanda or tailored from either Uganda or Congo, adding golden monkey trekking as one of your activities will surprisingly offer you what you will always treasure as a great memory.